Beautiful piece .. Solid bronze metal .. Lovely weight and feel for is size .. All in great vintage condition .. Please see description and photos below. 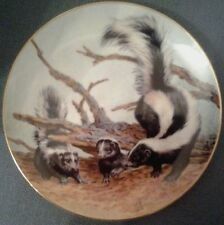 A beautiful piece .. Amazing detail for something so small .. All in great condition .. Please see description and photos below. China Rabbit And Tortoise Miniature Figurine Ornaments. Condition is Used. Dispatched with Royal Mail 2nd Class. 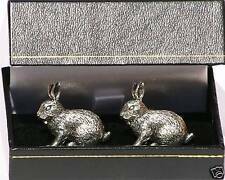 VINTAGE ZSOLNAY PECS RABBITS HUNGARY HAND PAINTED COLLECTABLE FIGURES X 2 Each measuring approximately 6.5cm high, these small collectable rabbits are in good used condition,please see pictures and thank you for looking. 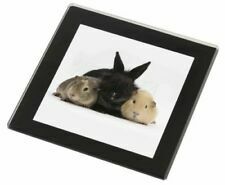 Great gift for a collector or rabbit/bunny fan ! 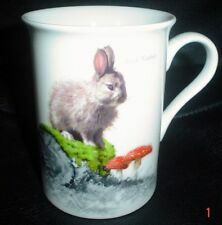 Szeiler Porcelain Rabbit 4cm Good condition no chips. I bought it is part of a set from Thailand recently. 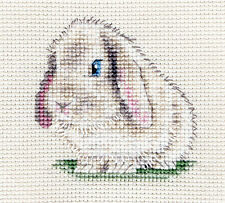 It is a lovely, very cute white rabbit. White all over and with detailed pink eyes and detail of the nose and mouth in pale pink. It has fleshy coloured inner ears It is up on its back legs and it is resting the front paws on its tummy - very cute. The colours on all are good and clear. There is slight wear to the bases underneath to all where they have been moved over surfaces. The white rabbit has a slight black line to one side of the neck where a previous owner appears to have been attempting to draw a collar?. Condition is Very good and clean 🧼. Made by Paw Prints. This is in new condition and is just perfect for the rabbit lover. Silver Marten Rabbit. 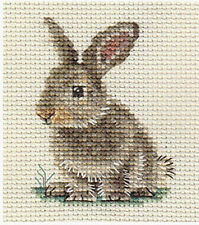 An Original counted cross stitch kit by Fido Stitch Studio. (N.B. 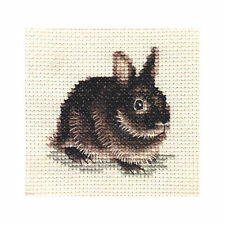 Colours of this rabbit is black and chocolate brown). 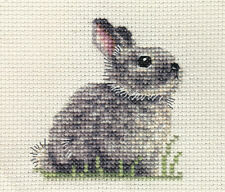 This ‘mini’ stitch kit could be completed in one or two evenings. Vintage RABBIT Japanese Ceramic Basket (can hold sweets) 4.5"
I usually display him at Easter on the cabinet with mini eggs in the basket. I have owned him for decades but don't know his. Brass Bunnies 4 in total ranging in size but all small Condition is Used. Dispatched with Royal Mail 2nd Class. EASTER LEGO BUNNY! PERFECT EASTER GIFT FOR EASTER! HIGHLY EGGCITING! HIGHLY COLLEGGTABLE! Hunt for eggs with this fun LEGO BrickHeadz Easter Bunny construction character. Check out its cute cheeks and enormous movable ears. SET OF 12 MINIATURE DOCTOR & NURSE RABBITS. BUNNY DOCTORS! NURSE RABBITS! These SWEET MINIATURE RABBITS dressed as DOCTORs and NURSES! YOU GET A FULL SET OF 12 DOCTOR RABBITS. They are fantastic for crafters as well, making really pretty additions to so many creative decorations and gifts - they also look great on cakes! I bought them as part of a set from Thailand recently. The features are clear and sharp. Code: 014 848 / Art. 7678 NR 030 000. Swarovski Crystal Rare and Retired. Mini Rabbit Resting/Lying. Condition Report: Perfect crystal. Boxed with certificate. Clear crystal with black eyes. rabbit family ornament. Condition is Used. Dispatched with Royal Mail 2nd Class. Lovlots City Park - Bella the Rabbit. Swarovski Crystal Rare and Retired. Light rose pink crystal rabbit with jet hematite eyes. A perfect Easter gift! Part of theCity Park group. Condition Report: Mint crystal. White Glazed Pottery Rabbit. Condition is Used. Dispatched with Royal Mail 2nd Class. Breeding Principles and Systems. RABBIT PRODUCTION. Paperback Book. Economics and a recording system. Nutrition and Feeding. Breeds of Rabbits. Rabbit by Francois Pompon (1855-1933). Pompon was a student of Auguste Rodin and famous for his animal sculptures. The Polar Bear sculptures were the most popular. Small White Porcelain Standing Hare Figurine. Ceramic standing hare. Matt white. We will always help you to have a 100% positive happy buying experience. Design /Print: Cute Guinea Pigs with the Wording 'Soulmates'. Teddy Bears Animal Soft Toys. Christmas Baubles. Christmas Collectables. Newborn Baby to Toddler Gifts. Bottle Opener. Mug & Coaster Set. 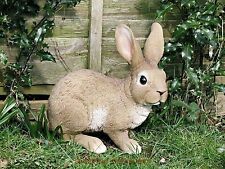 Sherratt & Simpson England Vintage Rabbit Tan Rare No damage . Condition is Used. Dispatched with Royal Mail 2nd Class. Measures base 6.5 cm x 4. Height 3.2cm. 1990's. Lovely silver effect resin rabbit with bow. Our curious bunny has hopped onto the spotty toadstool to say hello to the butterfly which is sunning itself on the edge. It's made of resin and is frostproof. Kitten Heels. This Bookmark is Made Using a Clear Wipe Clean Surface with a Black Velveteen Backing. Design /Print: The Cutest Guinea Pig Wearing a Flower in Hair. Christmas Baubles. Christmas Collectables. Part of the Fiddlehead fairy garden range, these bunnies are made from resin and fine for use outside all year round, or of course they will be happy enough inside too! These three bunny rabbits are going on an adventure. Design /Print: Four Cute Guinea Pigs Posing…. Christmas Baubles. Christmas Collectables. Mug & Coaster Set. Mug And Coaster Sets. A Lovely Slim Bookmark Which Will Make the Perfect Gift Idea for the Bookworm, Or Your Own Special Treat. Two bunnies, setting off on an adventure in a boat they've made from leaves. Let's hope it's watertight and the current isn't too strong! The boat is 8.5cm long and the bunnies are 5.5cm tall. They're made from resin, so fine outside all year round- don't worry about frost! Design /Print: A Cute Little White Gerbil in the Light of the Moonlit Night…. Christmas Baubles. Christmas Collectables. Newborn Baby to Toddler Gifts. Bottle Opener. Mug & Coaster Set. Mug And Coaster Sets. COLLECTABLE RABBIT WITH BASKET FIGURINE/ORNAMENT. WOULD MAKE A GREAT ADDITION TO ANY COLLECTION.